The Library for Blind and Physically Handicapped provides access to content that might otherwise be out of reach for those with impairments. The NLS (National Library Service for the Blind and Physically Handicapped) has long recognized that impairments do not have to be limiting and are dedicated to breaking down common barriers that prevent access to information. This year, on an international stage, individuals from around the world will demonstrate just how capable those with impairments can be while they participate in the Paralympics. With the appropriate tools, mentors, and venues these athletes have broken down many barriers both personal and societal. Athletic clubs for those with disabilities have existed for more than 100 years however, after WWII para- athletics saw an uptake in participation and a transition from rehabilitative to recreational to competitive implementations. The first Paralympic games took place in 1960 and have taken place every four years since that time. Beginning in 1982 the Paralympics has been set in the same city as the Olympics. 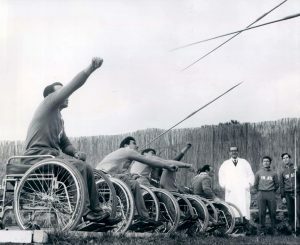 Eventually the collaborative efforts of several international organizations, which made the Paralympic events possible, led to the creation of the International Paralympic Committee in 1989. The Paralympics feature the best of the best – people performing athletic feats that most of us would never be able to do. It is an emotional roller coaster of near misses and unexpected blowouts. The opening ceremonies start tonight. Let’s all support our Paralympic athletes!